The TV season might be coming to an end as many shows have aired their finales over the last few weeks, but there are plenty of red carpet events and screenings as Emmy chatter is only just beginning. One of the major events this week was of course the end of Mad Men (and you can read all my tear stained thoughts here) and another chance for the cast to show off their sartorial prowess. While we have already documented Mindy Kaling’s Cannes fashion parade there are a few more pretty frocks to show off. Kiernan Shipka has been a revelation in her performance as Sally Draper and I really can’t wait to see what she does next. She has also consistently been the best dressed cast member and she’s still only 15. Please Hollywood, treat her kindly. At the Film Independent screening of Mad Men she wore a very cute Valentino white ruffled frock which complements both her age and look. As with Peggy Olson, Elisabeth Moss has really upped her style game over the last few years and this is a simple and fun outfit. The metallic belting is an edgy touch and I love the splash of color with the orange peep-toe pumps, even if they don’t entirely go with the rest of the ensemble. Back to Cannes and the Inside Out premiere with another metallic belted beauty; Amy Poehler sticks with Stella McCartney and it pays off. The Cannes red carpet photos have a habit of looking both overwhelming and incredibly romantic in a classic movie star way. This shot of Melanie Laurent falls in the latter camp and her super sparkly Zuhair Murad Couture beaded frock is adding to this effect. Another Cannes stunner and TV Ate My Wardrobe favorite; Diane Kruger has gone for an ethereal Prada frock for the Maryland premiere. Here she is with co-star Matthias Schoenaerts who, in not shocking news scrubs up well for the red carpet (everyone should go see Far From the Madding Crowd which is very good for reasons that also include Schoenaerts). Maggie Gyllenhaal is deservedly once again receiving praise and accolades for her portrayal of Nessa Stein in last year’s exceptional mini-series The Honourable Woman including at this week’s 40th Annual Gracie Awards. Wearing a super chic black Alexander McQueen gown with killer cuff detail and red lipstick to swoon over Gyllenhaal poses with husband Peter Sarsgaard. This has been a week where actresses have been confirming how awful Hollywood can be with Gyllenhaal’s comments about how she is too old at 37 to play a love interest for a 55-year-old – Amy Schumer’s ‘Last Fuckable Day‘ sketch is far too real – and Salma Hayek spoke at length about the many obstacles she has faced in this industry. It’s not just Chelsea Peretti’s Brooklyn Nine-Nine character Gina that gets all the style love from us here and at the Webby Awards where Peretti won Outstanding Comedic Performance (for the Netflix special Chelsea Peretti: One of the Greats) she wore a super hypnotic all the stripes Mason by Michelle Mason frock. Keeping things casual cool on the Red Nose Day red carpet is Rose Byrne. Those pants look like they could be satin and yet somehow she is making them work. At the Disney International Upfronts Kerry Washington also goes for a relaxed funky outfit and what appears to be a sweater and skirt is actually an Alexander Lewis dress. The green shimmer from her Le Silla shoes goes wonders with the metallic stripes. 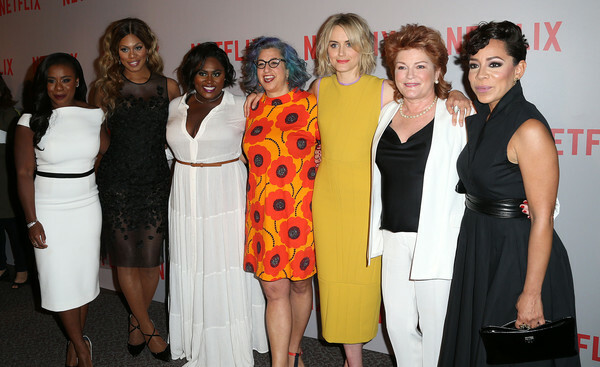 This Orange is the New Black group photo at a For Your Consideration screening and Q & A this week is delightful for several reasons including 1) Jenji Kohan’s dress, 2) so many good outfits/range of styles and 3) as a reminder that the new season is less than a month away. 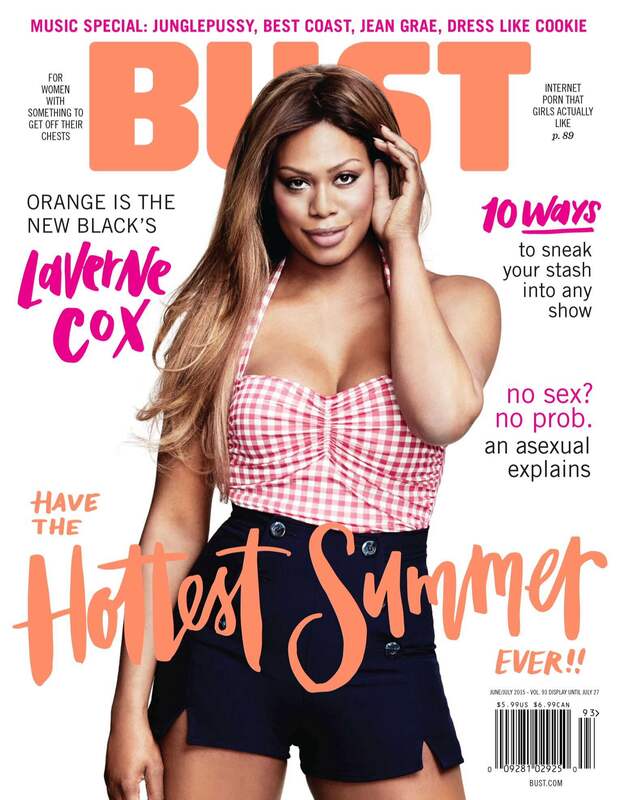 Orange is the New Black is nominated for 12 Emmys with 5 in acting categories including the incredible Laverne Cox (for Outstanding Guest Actress in a Comedy Series). 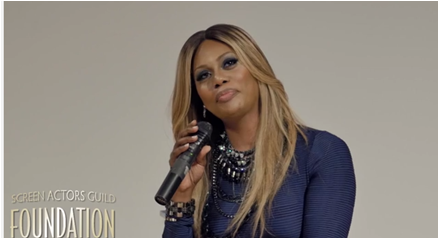 As part of the Screen Actors Guild Foundation Emmy nominee Conversations series Laverne Cox sat down with Mark Peikert, Executive Editor of Backstage – the series is in partnership with Backstage – to discuss the role/episode she is nominated for and her acting journey. The focus is on training and the acting process which sounds like it could be rather stuffy to someone who isn’t in this industry, but this is far from the case and I think I could listen to Cox talking about her experience for hours. Anyone who visits TV Ate My Wardrobe regularly will know that I love these kinds of discussions (particularly with fascinating women) from Comic-Con panels to Emmy roundtables and one reason I am such a fan of these longer discussions is that you get so much more from the person being showcased than you do in a regular interview. Part of this is because there’s something more informal about these chats so the participants will share more, but as Cox also mentions she has to shorten everything to sound bites for live TV interviews, whereas in this setting she can provide further insight. Cox is currently writing a book (when can I pre-order?) 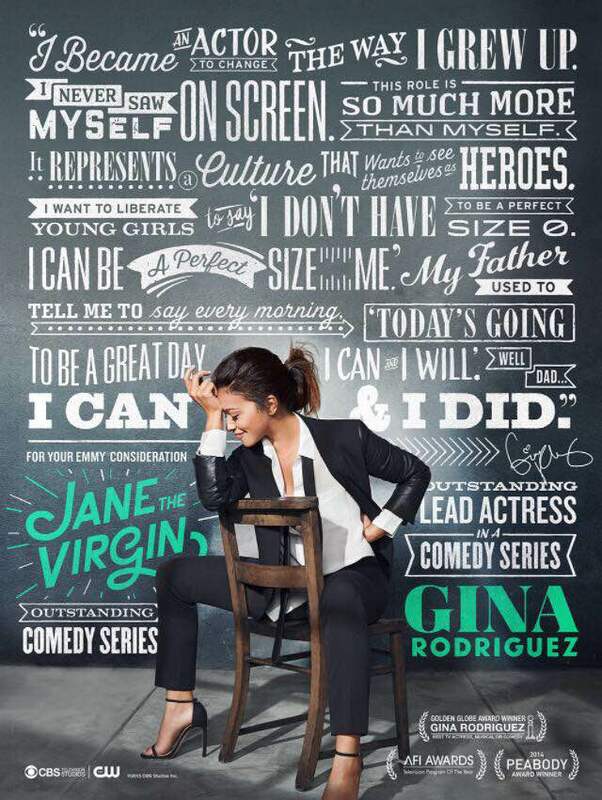 and while her publisher would probably like her to hold back on certain stories she goes into detail of what her first day was like on the set of OITNB (Jodie Foster gave her a tour of the set), the scene that made her realize how incredible and unique OITNB is, which piece of costuming puts her in the right Sophia headspace, her academic background and how dance training helps when performing a scene (and why she chose acting over dance). It’s a really fun discussion and kicking off this series with Laverne Cox has set the bar high for the other participants. 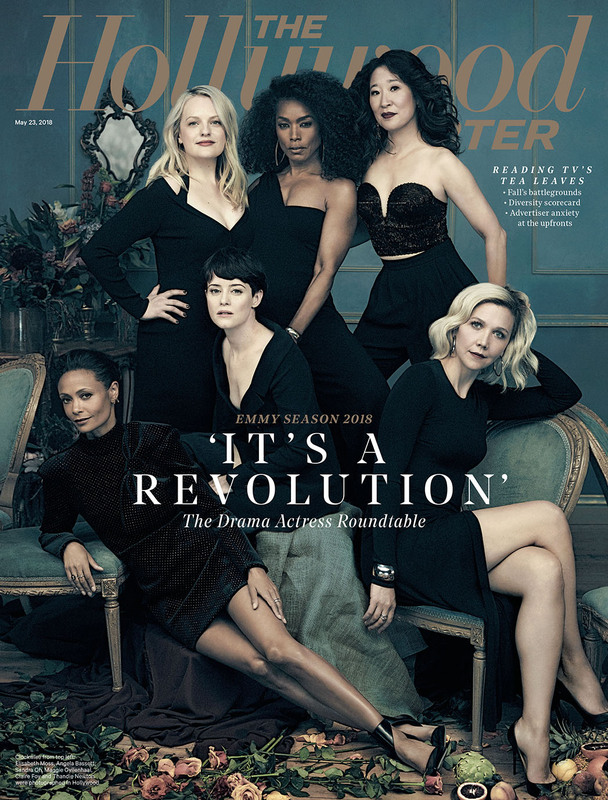 It’s the time of year when The Hollywood Reporter produces Emmy related TV roundtable discussions and while the quality of the conversations varies, the drama actress one is always lively and is generally my favourite of the bunch. Once again they have a group of women from shows that cover both network and cable, with the added new platform of Netflix to discuss their roles on TV, the industry and their past experiences. This year the participants are Monica Potter (Parenthood), Kerry Washington (Scandal), Kate Mara (House of Cards), Connie Britton (Nashville), Anna Gunn (Breaking Bad) and Elisabeth Moss (Mad Men, Top of the Lake). Expectations of how an actress should look comes up later but in a different way as they mention the backhanded compliments that people give such as they look “younger/skinnier” in real life. So don’t ever say this, it’s bad. This is part of the notion of intimacy between the viewer and the characters that come into our living rooms on a weekly basis and how the relationship is different between movies and TV; there is an investment in TV that doesn’t exist in the same way as in movies that generally have a beginning, a middle and end (depending on how long running the franchise is). Several topics are covered including other audition woes (Kerry Washington talks about the lack of roles for women of color), social media, political involvement and if they contribute to the creative process of their character. One thing I would like to see with these roundtables is a change in some of the questions as I feel like the best advice/worst advice comes up every single time. The penultimate question is a fun one as they are asked if they could be on any show in history what would it be? I love that both Kate Mara and Elisabeth Moss geek out over My So-Called Life (and earlier Moss is very open about her love of Parenthood). With any group discussion there are always some participants that are more vocal than the rest but at no point does it feel like one person is railroading the conversation. Elisabeth Moss comes across as very funny, something we don’t get to see that often on Mad Men and Connie Britton seems as wise as Tami Taylor. This is definitely a group of women I would like to go for drinks with. Watch the whole interview below and head over to The Hollywood Reporter for behind the scenes photos of the group. The monochromatic styling of the cover is on trend and I much prefer this more casual approach they over last year’s gown affair. In unsurprising news I really want to find out the shades/brands of lipstick they are wearing (especially Elisabeth Moss’).